UPDATE (Highlighted): Hi Readers. Lets Get to know The Samsung Galaxy Note 5 Specifications, Price, Features. The Samsung Galaxy Note 5 Features a 5.7 Inch Quad H.D display, 4 GB Ram, Octa Core Exynos 7420 CPU & Mali T 760 M.P 8 GPU. Talking about the camera department, It has a 16 MP Rear camera with O.I.S ( optical image stabilization.) Which is a great feature to obtain stabilized images and the Selfie camera is 5 MP. Talking about the design the Galaxy Note 5 has a metallic frame with rear glass panel. The most popular feature of Note 5 is its S pen Stylus which comes with an auto eject feature and this time the company has also improved its functionality. Corning Gorilla Glass 4. ( Increases durability of the phone). CPU/GPU Octa Core. (2.1 GHz Quad Core Cortex A-57 & 1.5 GHz Quad Core Cortex A-53) Exynos 7420. | GPU Mali T 760 MP 8. DISPLAY 5.7 Inch Quad H.D Super A.M.O.L.E.D. Resolution 2560 x 1440 pixels (~518 p.p.i pixel density). CAMERA REAR 16 MP. Resolution 5312 x 2988 Auto focus with LED flash. | Features. O.I.S (Optical image stabilization) Dual Shot, Touch focus, face detection, panorama, H.D.R, Geo-tagging. | Video Features. 2160 p @ 30 F.P.S. 1080 p @ 60 F.P.S, Dual video recording, H.D.R recording | FRONT/SELFIE CAMERA 5 MP (f/1.9 aperture), 1440 p with Auto HDR, Dual video call support. NETWOR 2 G/3 G/4 G L.T.E Support. BATTERY Non Removable. Li-Po 3000 m.Ah. STORAGE 32/64/128 GB Internal. Not Expandable. FEATURES Corning Gorilla Glass 4 Protection. | Fast battery charging : ( Quick Charge 2.0. | Super A.M.O.L.E.D Quad H.D Display. | NFC | Fingerprint Sensor. | S Pen Stylus. | Wireless Charging. SENSORS Accelerometer, gyro, barometer, proximity, compass, Heart Rate, Gesture, U.V, S.P.O2. The Note 5 is expected to launch for a price tag of around 50,000 Rupees in India. 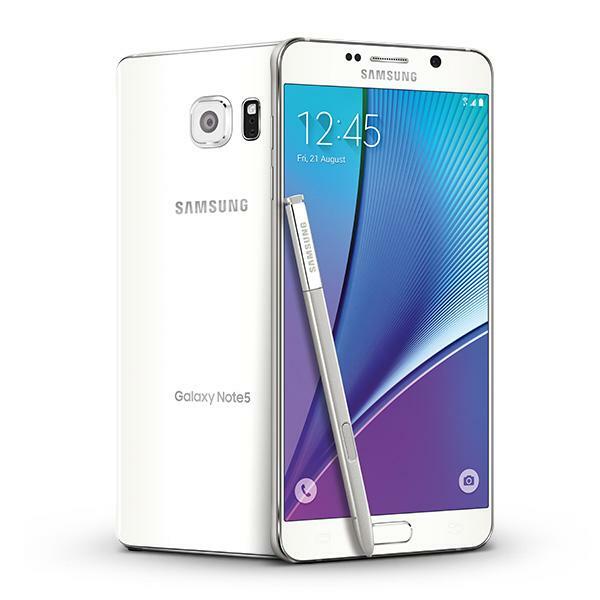 The Samsung Galaxy Note 5 is now available for a price tag of 47,900 Rupees in India. It is available in 3 color options i.e Black Sapphire, Gold Platinum, Silver. Share your views via comments below.